What are the strongest E-Maxx shocks? I lost two shocks trying to keep up with truggy's at a track this weekend. I'm ready to get some good/strong shocks. Are proline powerstrokes the strongest or front buggy shocks? also what will fit with the stock axles on my 3.3? I have used BigBores, PowerStrokes and UE SuperShocks. IF you are racing the PowersStrokes are more tunable and you may like them better. If you are bashing the UE or !/8 scale buggy shocks IMO would be better. All I'm looking for is something that I can beat the snot out of and not have to fix as much as stock. 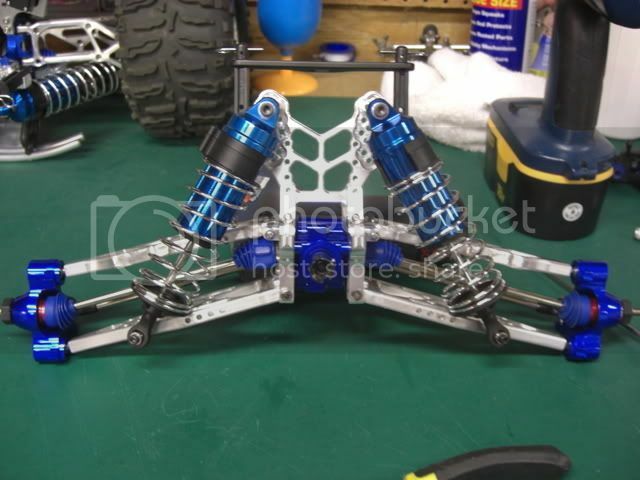 Would BigBores work or are the 1/8th buggy shocks stronger? 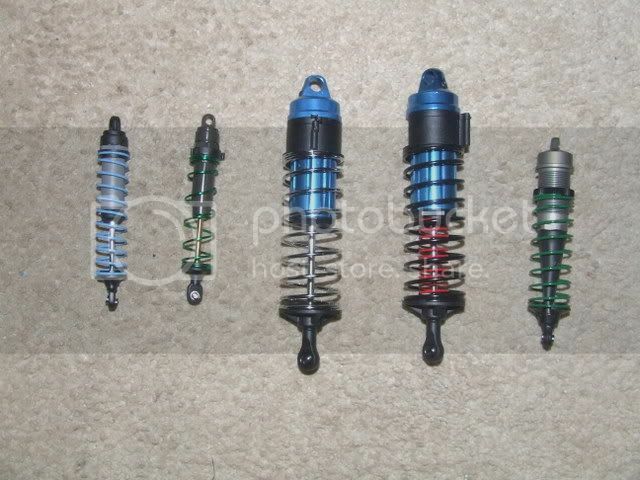 also what buggy shocks are a good deal? Associated RC8 front shocks would be your best bet. I picked up the Losi 8T shocks, very nice too. The UE shocks are much more durable than the bigbores. the bigbores are nice annd i use them on my other cars i.e. my firestorm, but i switched from bigbores to 4 UE shocks on my maxx and they are much better and more durable. 4 Losi would be good but they are huge. You'll need to modify your arms and if you are a heavy basher that mey cause other weak spots. I bashed the snot out of Powerstrokes and UE shocks without a problem. Thanks for the help. I'm narrowing it down real fast. Anyone have pics or testimonials of the shaft size on the Bigbores vs Losi 8ight vs Proline? I'm sure I'll have $$$ into this so I only want to do it once. How about a side by side of proline and losi 8 shocks? Sorry I did not label that pic. Those are BigBores and PowerStrokes. Last edited by mkrusedc; 06.25.2008 at 03:02 PM.